The SBTET, AP will conduct “POLYCET” every year for the candidates seeking admission in to all Diploma Courses in Engineering / Non Engineering/Technology offered at Polytechnics / institutions (including Aided and Unaided Private Polytechnics / Institutions running as 2nd shift in Pvt. Engineering Colleges) in AP State . The SBTET Andhra Pradesh issued the POLYCET notification on .. April, 2019 and invited the online applications from the eligible candidates for admission into polytechnic courses from ......... and the AP POLYCET 2019 was conducted successfully on ... by 11 AM to 1 PM in all the Districts and the Results of AP POLYCT 2019 has been released on....by the SBTET Andhra Pradesh. 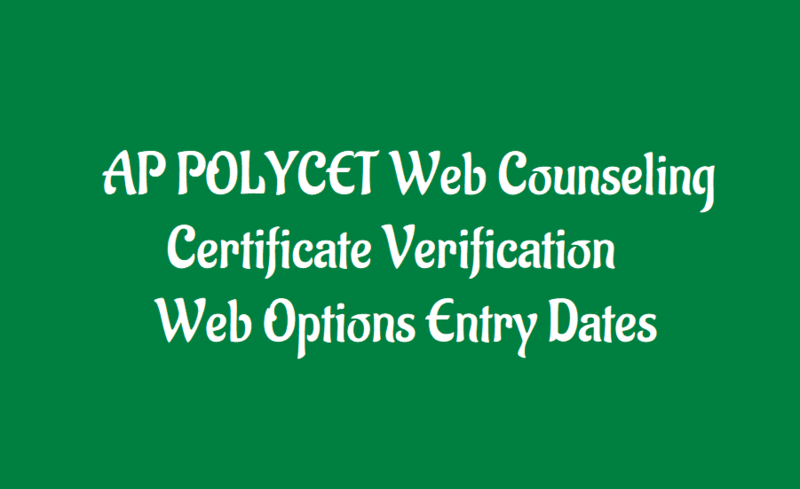 The Qualified candidates of A.P-POLYCET-2019 are informed that the admission into Polytechnics will be conducted based on Web Counseling. The detailed procedure of Web counseling and other instructions can be had from the Help Line centres on the day of Certificate Verification and is also available at https://appolycet.nic.in. - PH/CAP/NCC/Sports/Minority/Anglo-Indian Certificate if applicable. The Candidates of SC/ST category have to pay Rs. 200/- While OC/BC/Minority candidates have to pay Rs. 400/- towards Processing Fee. Tuition fee payable after allotment varies between Rs.3,800 to Rs.21,000 per annum depending on type of college allotted. The reimbursement of Tuition fee in respect of all eligible candidates will be as per the orders issued by Governments of Andhra Pradesh & Telangana states from time to time. However, all the candidates have to pay Rs.600/- towards A.P-SBTET recognition fee as prescribed.